Madison, 1999. 12-year-old Amelia’s missed out on a great spring break. Instead of going to Florida, her best friend went to France without her. She spends her days at the ceramics studio while her widowed dad, a professor at the university, does research. But at the workshop is a new face, the owner’s nephew, and he’s dealing with his parents divorcing. As they mold their clay (she’s great, he not so much), they come up with a game where they name strangers, and one of them, whom they name Epiphany, seems to be following Amelia. Could this be her long-lost mother? Henkes’s latest is quiet and spare, but it’s also as delicate and expressive as one of Amelia’s ceramic rabbits, poetically capturing the joys, worries, and uncertainties of her life. Kevin Henkes is a star picture book author and illustrator. With Sweeping Up the Heart, he proves again that he's also a talented writer for older kids. Twelve-year-old Amelia's fantasy spring break is ruined when her father won't take her to Florida. She has no memory of a mother who died when she was just two years old, and her father doesn't seem able to connect with her life. Things are looking dismal, but Amelia's love for making clay animal figures at a local studio changes everything and leads her to new friendship, a renewed family, and confusing, unfamiliar feelings. I think middle grade readers will truly enjoy Henkes' characters. The kids and the adults are creative, positive people. They make perceptive observations about life and still sound so natural. This book is a quick read with a mature wisdom, and it's very easy to love! 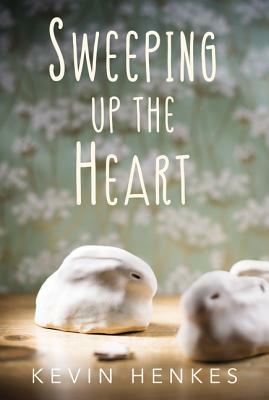 With themes of family, death, grief, creativity, and loyalty, Sweeping Up the Heart is for readers of Kate DiCamillo, Rebecca Stead, Lauren Wolk, Kimberly Brubaker Bradley, and Pam Muñoz Ryan.